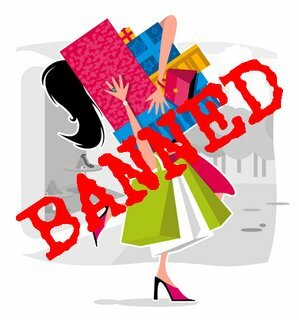 Forever out of place: Thoughts on my shopping ban. I haven't advertised it too much, but, inspired by the girls at "Her late night cravings" I decided it was time to start a shopping ban. It's not that I have been shopping like crazy, lately - quite the opposite. It's just that I have to pay for mandatory maintenance work on my apartment, and I can't really afford to buy much. This situation will last at least until December, so ideally I should stop buying clothes/shoes/accessories at least until then. And I seriously think I should be able to make it with what I have in my closet. I don't have a lot of clothes, but they surely are enough. There is stuff I don't wear too often - and it's a shame. There is one Max Mara skirt I bought in January which still has its tags on. And there is the stuff I wear over and over and I was getting sick of. Then along came the FABruary style challenge proposed by Imogen Lamport. She really had the right idea at the right time. Although I don't take pctures every day, I am following her suggestions day by day (well, except these three days I was sick at home). It forced me to think a bit outside the box. Like, when the theme was "Florals" and I thought "I don't own a single floral item". And then remembered my floral dress or earrings. So, I have discovered how much helpful for me are these daily suggestions. Imogen, if you are there, a similar challenge would be welcome for the month of March too! But in case she had enough, I decided to come out with my personal calendar. I picked pictures from my favourite bloggers (one in particular), and wrote my own. I made it without thinking of what I have or not. I decided the exercise is in coming up with something I wouldn't have thought - and without buying anything new! As for the shopping ban, I won't come to the extremes of the 365 fashion rehab girls: if my socks/tights/underwear have holes in it, I'll buy some new one. I'll happily accept gifts too! It will be interesting, I guess, since I have to go to two wedding is June. But I have already thought of taking to the tailor two dresses I don't wear anymore because they are too big, so this problem should be solved. The problem will be the shoes, let's see what I can do (borrow from my sister? Who knows...). I won't cut my beauty treatments or hair salon visits, mainly because I don't have much free time, so I am not spending that much on them anyway. In the meantime, I have been re-reading "In the red", and after this I'll go with "Not buying it", hoping they'll motivate me. I am excited to see how this experiment will end up. It will be interesting for sure. Good luck. I completed an entire month myself + 1 week extra.